SCVHistory.com TLP4601 | Tataviam Culture | Chief Frances Cooke: Death Certificate, 1946. Death certificate for Chief Frances Garcia Cooke, matriarch of the Cooke and Garcia families. Frances descends from individuals who lived at Chaguayabit village (Tsawayung), aka Castaic Junction, prior to European contact in 1769. She is the paternal grandmother of Chief Charlie Cooke (1935-2013) and the mother of the paternal grandmother of current (2015) Chief Ted Garcia Jr. According to her death certificate, Chief Frances died as a result of injuries sustained in a July 18, 1946, car crash on a public highway in "rural San Fernando," probably near Newhall. She was taken to Newhall Community Hospital where she succumbed to her injuries (a punctured lung) eight hours later, at 1:15 a.m. on the 19th. Mortuary services were provided by Noble of San Fernando, and she was buried in the Ruiz-Perea Cemetery in San Francisquito Canyon on July 23, 1946. 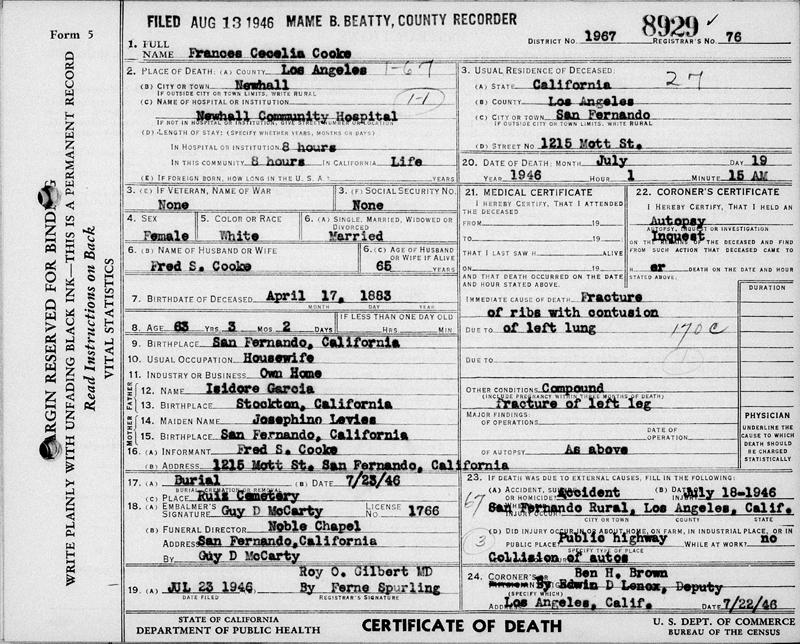 Vital statistics for the death certificate were provided by her husband, Fred S. Cooke. He gives her name as Frances Cecilia Cooke; one will note that Fred, who was born "Cook," added the "e" to his surname. He gives Frances' birth date as April 17, 1883. Note that her grave marker, fabricated sometime after Fred's death in 1958, shows Frances' birth year as 1884. Her parents are listed as Isidore Garcia, born in Stockton, and Josephine Levies (a variant of Leyvas/Leiva), born in San Fernando. Her race/color is listed as white. Fred gives a home address of 1215 Mott St. in San Fernando. TLP4601: 19200 dpi jpeg, courtesy of Tricia Lemon Putnam.